Naturally Nova Scotia's Green Tea Extract contains many powerful and beneficial components, specifically caffeine and a cathechin called EGCG. Naturally Nova Scotia has done a whole leaf extract to make these ingredients available to you in tablet form! Try Naturally Nova Scotia's Green Tea Extract to support your weight management. As with any weight loss plan, its benefits are best complimented with exercise and a balanced, nutritious diet. 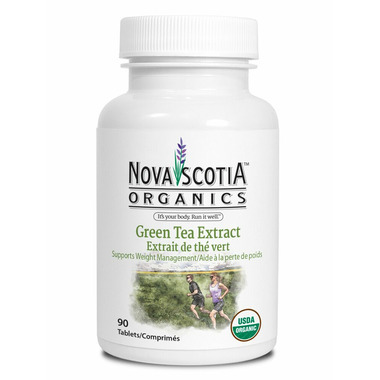 Naturally Nova Scotia’s Green Tea Extract tablets provide 360 mg of all natural green tea leaf in a safe and effective form that is certified organic! Adults : Take 3 to 6 tablets per day with food. Do not exceed 6 tablets. Consult a health care practitioner for use beyond 12 weeks. Consult a health care practitioner prior to use if you have a liver disorder or develop symptoms of liver trouble, or if you have an iron deficiency. Consult a health care practitioner prior to use if you are pregnant or breastfeeding. Keep out of reach of children. Do not use if packaging is damaged. Tapioca Starch*, Evaporated Cane Juice*, Maltodextrin*, Carnauba Wax*. Store between 15 and 25°C in a dry place.